I’m a sucker for chocolate in all forms. 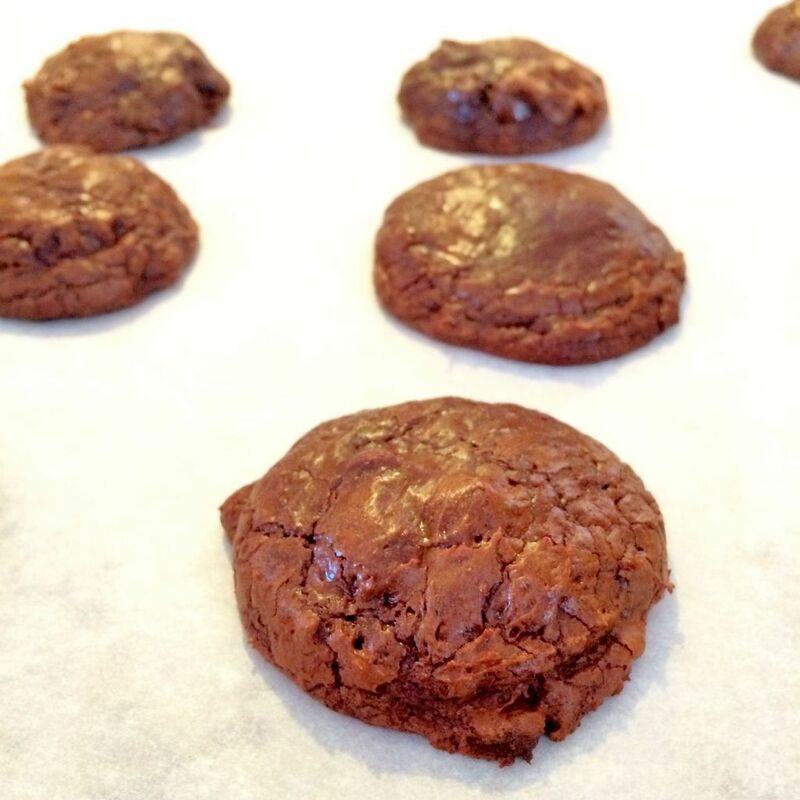 These cookies have a distinct chocolate taste and a great texture. I bet you can’t eat just one. I don’t know about you but I find supermarket tomatoes to be flavorless during the best of times. And for the tomato, mid-winter in New England isn’t the best of times. So when the little bins of grape and cherry tomatoes call to me, like they do, I have to figure out a way to give them a flavor boost. Baking the tomatoes can be that boost. Toss the tomatoes with 1/2 teaspoon of olive oil. Transfer to a 13″x9″ glass baking dish. In a bowl combine the remaining olive oil and all other ingredients except the chicken. Mix well. Add the chicken thighs and toss to coat. Place the thighs on top of the tomatoes. Bake for 40 minutes, rotating the pan 180 degrees after 20 minutes. The chicken should reach at least 170°F on a thermometer before serving. 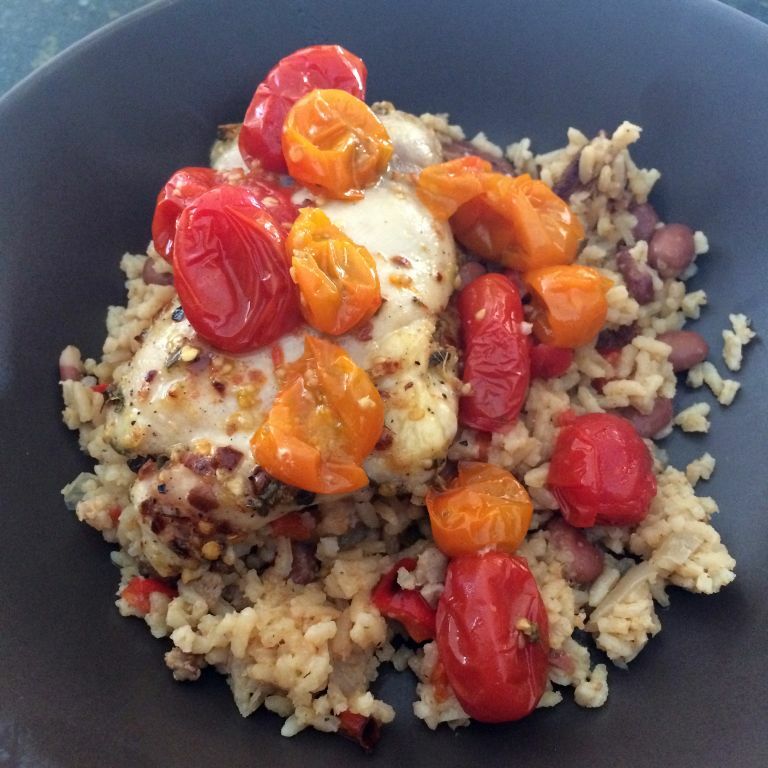 I used a combination of red grape and yellow cherry tomatoes. I like the color combination in the finished dish. Adjust the amount of crushed red pepper to suit your taste. I found it a little spicy but not overwhelming. I could still taste the other ingredients. If you have sensitive taste buds add a little less. If you like all things hot and fiery then add more. The finished dish produces a fair amount of flavorful liquid. We ate ours with some leftover dirty rice which absorbed the juice nicely. These week’s menu brought to you by the letter V, whose birthday we celebrate today. On a recent Saturday night I needed a second side dish. After finding a bag of frozen peas I set about figuring out how to make them more interesting than just microwaved frozen peas. Combine the onion and mushrooms (stems & caps) in the bowl of the food processor. Pulse in 1 second increments until mushrooms are cut fine, scrapping bowl as necessary. About 10 pulses did the trick for me. Add the olive oil in a 12″ non-stick skillet and place over low heat. Add the mushroom mixture in an even layer; sprinkle with a generous pinch of kosher salt and several grinds of black pepper. Cook for 5-10 minutes. The mushroom mixture is ready for the next step when most of the liquid has been given up by the mushrooms. Add the frozen peas to the skillet and cover. Cook for 5 minutes then stir to incorporate the mushrooms and peas. Continue cooking until peas are just heated through, about 5 minutes longer. Add the butter to the pan, allow it to melt and stir to coat the contents. Taste and adjust seasoning to your liking. Serve and consume. My first thought was to just slice the mushrooms, cook them in a little butter and add them to microwaved peas. As I started to prep the mushrooms I decided that was still a little bland and boring. I decide to make a sort of mushroom duxelles. 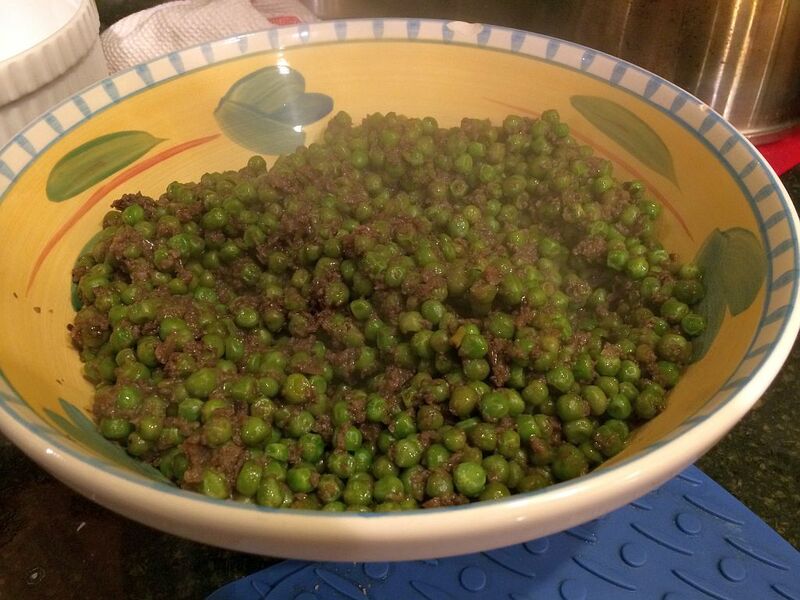 I think the finely chopped mushrooms went well with the peas. The end result was tasty. I rarely get a chance to cook a Thanksgiving-like dinner in November. My sister-in-law handles the family duties. Various obligations and traditions make it impossible for our regular get together. And let’s face it, most of us are sick of turkey once the holiday itself, and the leftovers, are done. This week I saw a thawed turkey at the grocery store while picking up provisions for our weekly get together. The rest is tasty history.